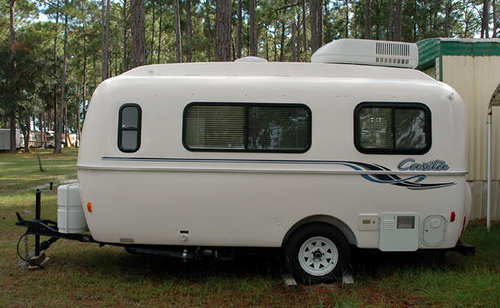 The company has been making the Casita trailer since 1983. The aerodynamic design of these lightweight and durable small travel trailers make this American favorite very easy to tow. The spacious interior makes travel trailer living cozy and convenient, and the insulation used for these small campers is sufficient to keep you cool in the summer and warm in the winter. Carpet materials are used on the walls for better insulation, and to prevent condensation from forming. These small travel trailers with their lightweight fiberglass construction can handle rough roads, are wind resistant, easy to clean, rust-proof and will give you years of traveling enjoyment. The two-shell construction, 3" channel-steel frame, and fiberglass finishes makes this one of the best travel trailers in the business. The standard models do not include bathrooms, but deluxe Casita travel trailers have full bathrooms with a toilet, shower and air conditioning. Deluxe models can have appliances, accessories, separate sitting and dining areas with swivel captain chairs, picture window, a large shower and bath. The Spirit deluxe fits 2-6 people and floor plans can include a bunk bed or a permanent double bed with bath and shower facilities. The liberty deluxe 16 and 17' has a convertible bed, two single beds or a king size bed, large picture window, and scenic wrap around viewing. It's a great small travel trailer for couples that want to travel light. The compact design makes the compact trailer is easy to maneuver down the road or in RV parks and you'll have these small campers set-up in minutes. The company recommends your vehicle have a 3500 pound towing capability. There is a factory tour available for those who are interested in viewing the manufacturing process. You can expect quality construction, great attention to interior design and function, as well as quality appliances and extras in a casita trailer. Many people love them for extended travel or even full time small travel trailer living.